Once again Rocking the walls in RetroClassica body works. This time at Jenson’s request Lightening McQueen has been added. I think this would be awesome as a kids bedroom wall ! 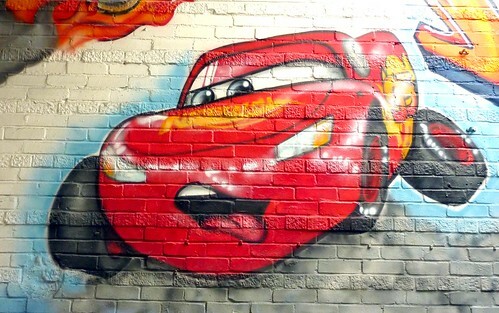 This entry was posted in Artwork and tagged bedroom graffiti, Disney Cars Kids bedroom Graffiti, disney graffiti bedroom mural, kids bedroom art, Lightening Mcqueen Graffiti kids bedroom, Lightening McQueen painting. Bookmark the permalink.